Platform lifts, also known as disabled access lifts, are primarily used to transport those with limited mobility, usually wheelchair users, to different floors of a building. Platform lifts are often seen with non-enclosed platform carriages, but these lift styles are only used to carry passengers up a maximum of 3 metres, and any height above this must be enclosed for safety. Platform lifts differ from standard passenger lifts because they don’t have an enclosed carriage inside the lift shaft; instead they use an open L-shaped platform which doesn’t have walls and is independent from the lift shaft. This means that the walls of the lift have in-built safety edges, and the shaft walls have sensitive cell protection to ensure safety and comfort. Platform lifts work on a screw driver basis which is similar to a scissor lift. This system is made up of the platform, which sits on a structure of crossing jacks which have joints, enabling them to fold. The jacks are connected by a shaft and powered by an electric motor. When the motor propels the shaft it pushes the jacks together, causing them to fold vertically, rather like constructing or collapsing a clothes horse. As the crossing jacks move from their broader horizontal position to their thinner vertical position, the platform rises because the changing shape of the zig-zagging jacks adds height to the structure. The image shows an illustration of this mechanism. Apart from their mechanism and design, another marked difference between platform lifts and passenger lifts is that they are operated manually by a touch button. These buttons are designed for easy accessibility as they are highly sensitive to touch and illuminated. Although you are required to continuously press the button during travel, this means the lift can be stopped and started throughout the ride for a slow and controlled transition between floors. It also means that users have more independence and purpose when they use the lift. Platform lifts are ideal for public and commercial buildings, as they assist disabled and immobile customers to access all areas of the building in a safe and convenient manner. The compact nature of these lifts means they can be used where space is restricted. These lifts can also be installed into homes very easily, and due to the compact mechanism they don’t require a machine room. Axess2’s Lyfta screw-driven model can be installed without a pit, meaning it saves room and eliminates the need for below-floor digging. At Axess2, we supply three different types of platform lift which are all compact, easy to install and very cost effective. These lifts are designed to carry a maximum of 250kg in weight, which equates to two people and a wheelchair, so it is perfect if disabled users wish to ride with a companion or carer. These lifts are perfect in commercial properties, domestic settings and public buildings; such as libraries, doctors and schools. We supply a range of lifts depending on your requirements and available space in your building. Liberty – this lift is different to the other two available models as it is powered by a hydraulic system. This means it does require a pit, so it may not be suitable for buildings where below-floor digging isn’t possible. However, if you wish to install the mechanism above ground, the lift can be raised and accessed by a ramp. This lift is designed for optimum safety; the self-contained lift has safety edges on the platform and a safety hand rail. It is also fitted with battery backed-up lights and alarms to make the user feel secure. Lyfta – this compact and efficient lift is powered by a screw system for low energy operating. The lift is delivered and installed as an entire unit, which includes a shaft and platform, and it can be installed very easily in one to three days. The screw mechanism eliminates the need for a machine room or pit, so it can be installed straight onto floor level. This lift can take a maximum of five people, and has a travel range of 13 metres, so it is appropriate for commercial and public buildings. 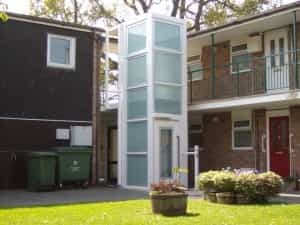 Cube Compact Home lift – the Qube compact home lift is ideal for those who need assistance to gain access to different floors in their home. The Qube focuses on design flexibility; it is available in three different sizes so you can adapt the lift to your home. You also have control over the aesthetics of this clever screw-driven lift. You have the freedom to choose the shaft colour, interior colours, floor type and lighting. This lift is very good value for money, and has an A rated energy performance.